After an atmospheric, moodsetting intro piece Luxembourg duo Funerarium presents traditional black metal in the vein of the Scandinavian pioneers of the genre with their debut "Nocthule". Playing generally at mid-tempo with well-placed faster sections Funerarium take cues primarily from "Diabolical Fullmoon Mysticism" era Immortal or (early) Dark Funeral whenever they speed up their material. 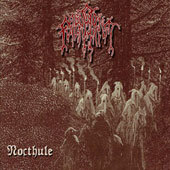 Recreating at once the hateful and desolate nature of Scandinavian black metal this duo is able to live up to the lengthy shadows of its inspirations. De Rais handles all string instruments with drummer Necroshadow laying down an impressive storm of percussion. The production values are on par with the Scandinavian inspirations of this band and convey the much needed oppressive atmosphere that a record like this calls for. The artwork, design and lay-out hearken back to the earlier days of the genre (the first Ancient Rites album comes to mind) and are refreshing to see amids all the colorless underground black metal art of the last years. Overall, Funerarium do an excellent take at carbon-copying this genre without adding anything their own in to the mix. It's competently written, instrumentally handled professionally yet nowhere does Funerarium show a face or idea of its own. If you like Scandinavian black metal done the way it should this band is a sure bet, although you might have heard it before earlier.